Got the shakes? Our vibration isolation systems should calm things down. Vibration noise is a nuisance for many precision applications in science and industry. Passing road, rail or air traffic, building resonances, co-workers, air conditioning, lifts and other machinery and equipment all pose a threat to your sensitive instruments. This could be a high-powered microscope, a delicate micromachining system, a life science experiment, or a laser-based optical set-up. Elliot Scientific offers a choice of both passive and active vibration isolation systems from leading manufacturers for your application. Whether you require a simple benchtop platform, an optical table, workstation, or custom system, we can help. We also supply Hi-Fi audiophiles with affordable antivibration solutions for decoupling high-end turntables so as to get the most from their vinyl. Click here for passive systems from Kinetic Systems Inc.
Or, for advice on the which is the best solution for your application’s problem, please contact us. For fifty years the company has been at the forefront of vibration isolation and control, developing many state-of-the-art technologies used in vibration isolation, damping, and structural design thanks to continuous research into the effects of vibration on equipment and structures. Kinetic Systems is a trusted name in academic, industrial, and government research facilities worldwide. The company offers the best in advanced vibration isolation and optical tables for metrology, interferometry, laser research, semiconductor manufacturing, and virtually any other application where external vibrations can adversely affect the operation of precision equipment. If you have a vibration isolation problem then please contact us for further information. For over 20 years the Halcyonics brand name has been associated with market-leading Active Vibration Isolation solutions. Designed and manufactured by Accurion, the company’s portfolio of platforms, workstations and modular support units can be found in labs throughout Europe and beyond. Now, Elliot Scientific brings this popular anti-vibration product range to the fore in the UK and Ireland. Applications that can benefit from a Halcyonics system include: scanning probe microscopy, inverted optical microscopy, confocal microscopy, profilometry, nanoindentation, patch-clamp setups, laser experiments, ultra-precise weighing, micromanipulation such as IVF, Hi-Fi turntables and many more. Accurion offer Benchtop, Workstation, and Heavy-duty Halcyonics systems to provide active electronic vibration isolation for sensitive equipment. This can range from a small instrument to a large apparatus that might weigh hundreds of kilos. For more information and a video demo visit our Accurion pages, or contact us. Kinetic Systems has introduced a new concept in vibration isolation for applications involving a moving load – the Vibralevel DSM Dual Stiffness Isolation Mount. Providing the optimal combination of damping and vibration isolation, the Vibralevel DSM is a cost-effective alternative to active vibration isolation systems. 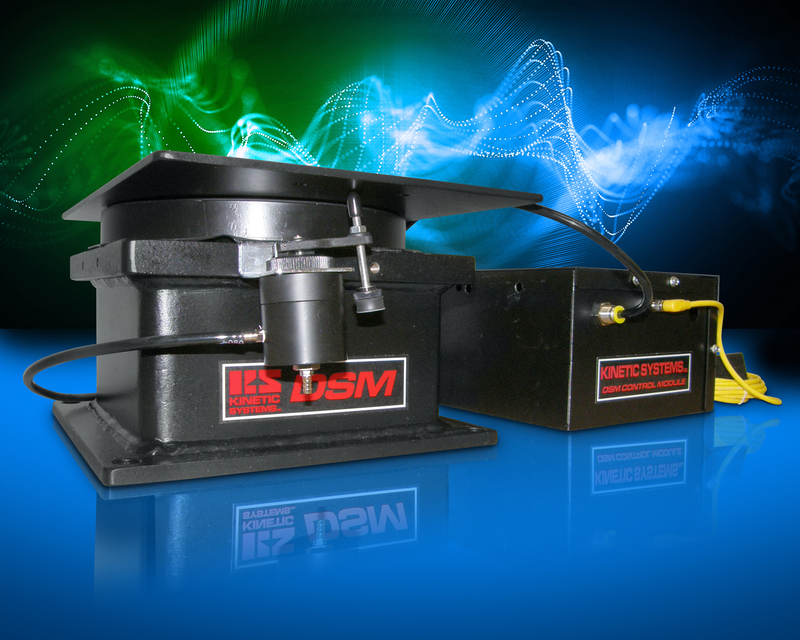 Designed primarily for applications where a moving load is supported on vibration isolation mounts, the Vibralevel DSM virtually eliminates platform tilt by going into stiff mode when a load undergoes an aggressive move. Signalled by the machine controller, the mount transitions from a softer vibration isolation system to a stiffer support platform in under 500 ms. Once the move is complete, the system reverts to “soft” mode, providing the vibration isolation required for accurate placement or inspection. The Vibralevel DSM is ideal for applications involving both shifting loads and the need for pinpoint positioning, for example, large coordinate measuring machines or flat panel and wafer inspection systems in which a sensor moves rapidly to specific locations for measurements. It is also well-suited to die bonders, systems with robotic arms, and pick-and-place machines that must move items to precisely defined points. For more information on how Vibralevel can improve your applications, please contact us. Due for release in 2013, Lake Shore are refining the instrument’s capabilities in line with the requirements of leading researchers from labs around the world. Click here for more information on this new THz system and details on how you can contribute to its development. Ideal for measuring electrical, electro-optical, parametric, high Z, and Hall effect, as well as DC, RF, and microwave properties of materials and test devices, the CRX-VF is widely used to measure nanoscale electronics, quantum wires and dots, semiconductors, and spintronic devices. Please contact us for more information about any of these or other Lake Shore products. Anti-vibration leaders Kinetic Systems of Boston offer versatile, ultra-low-natural-frequency optical table isolation support systems to researchers in the UK and Ireland. Available only through Elliot Scientific, the MK52 optical table isolation support system achieves low net vertical natural frequency without limiting its ability to support static loads due to its unique Minus K® negative-stiffness technology. Horizontal isolation is provided by beam columns connected in series with the vertical-motion isolator. When adjusted to a ½ Hz natural frequency, the MK52 achieves 93% isolation efficiency at 2 Hz, 99% at 5 Hz, and 99.7% at 10 Hz. The MK52 support system can be configured for a wide variety of locations and applications – wherever external vibrations can adversely affect the operation of sensitive equipment. Ultra-low natural frequencies, high internal structural frequencies, and excellent vertical and horizontal isolation efficiencies make the system well-suited to applications such as analytical balances, cell injection, confocal microscopes, patch clamping, optical microscopes, wafer probing, sensor calibration, and laser applications in fields such as semiconductor processing, telecommunications, aerospace engineering and medical research. The MK52 is also ideal for applications requiring high resolution, such as Raman spectroscopy, atomic force microscopy (AFM), AFM-Raman integration and micro-hardness testing. For more information on this and other vibration isolation tables and breadboards from Kinetic Systems, please contact us. To read it online magazine-style click here. To download it in your browser as a PDF, click here. Elliot Scientific is introducing a new, versatile, ultra-low-natural-frequency optical table isolation support system to researchers in the UK and Ireland. The MK52 optical table isolation support system, from anti-vibration leaders Kinetic Systems of Boston, achieves low net vertical natural frequency without limiting its ability to support static loads due to its unique Minus K® negative-stiffness technology.